It brings an explosion of small businesses and consumers under one roof. Attendees delight in the treasures of small businesses in and around metro Detroit in this highly anticipated, media exposed event. All Things Detroit has earned its place as one of the city’s most exciting events for small businesses to increase brand awareness. 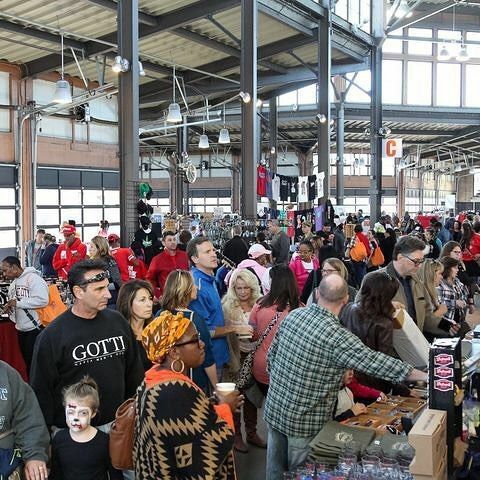 What makes All Things Detroit different from your typical trade show is that the event showcases small businesses in a way that’s fun and exciting, exposing Michigan’s best kept secrets. During these events, attendees have the opportunity to dine on Detroit delectables and sample savory sweet treats, as well as acquire acclaimed products and services from in and around Detroit. Most importantly, partrons and participants are also supporting small businesses. All Things Detroit is not just a company or organization; it is a community of people, businesses and supporters. It's also a memorable and fun day of entertainment, local food and homegrown products. from entrepreneurs, creatives and entertainers, all ready to be discovered by excited patrons whose numbers have kept growing over the years, and whose energy flows throughout the event. There are unique apparel, trendy clothes, great food, uncommon products, local treats, artisan products, one-of-a-kind masterpieces, and many other things you'll just have to enjoy uncovering on your own. It's a constant flow of wonder and magic to take home. One of the great attractions of the event is how you get to meet the people behind the products themselves. Plus the engaging stories behind them. Some are fun and exciting, while others are deep and have become inspirational narrativevs of achievement from humble beginnings or even adversity. It is as much a fun day to shop as it is a celebration for the triumph of the spirit of Detroit. An apt guiding compass for the company's founding, and the many layers participants can enjoy in a collective, uplifting state of mind that is All Things Detroit. All Things Detroit is the event that enables you to find Michigan's best kept secrets! All Things Detroit was founded by Jennyfer Crawford, who had more than 10 years of project management and business planning experience under her belt prior to starting All Things Detroit. All Things Detroit started as a valuable addition to her consulting and event planning business that provided valuable support and guidance to small businesses through services like branding, plublic relations and marketing at affordable rates. This jived with her approach to providing more tools and resources for helping small business owners grow their brand, showcase products or services, generate revenue, and promote togetherness for the small business community. Today it continues to grow at a brisk pace, with vendors now numbering in the hundreds and with each event building on prevous ones to add even more value to vendors, patrons and all the happy participants. A special kind of marketplace made especially for local communities online, connecting small businesses with discerning patrons who want great finds from across local America but reachable anywhere. All Things Marketpalce helps you find (and for vendors-- sell) a location's best kept secrets in the myriad forms and wonders waiting to be discovered. Visit us today, and visit often, to own unique local treasures that is constantly growing, and experience the creative genius from across the map. A nationwide community of small business owners working to inspire one another and collaborate on serving our business needs. Our three main principles remain: connection, communication and collaboration! We profile stories of small business owners who took risks to grow a great idea into a profitable business. The single mom-epreneur who demonstrates balancing work and home life, or the risk-taking artisan who quit a corporate job to pursue a passion for the arts, are some examples of the many profiles that will inspire you. We encourage you to connect with us, ask questions, and possibly collaborate on ventures that will make our businesses better. With more than 10 years of project management and business planning experience Jennyfer Crawford developed a business of consulting and event planning. As an entrepreneur who built her own successful business right from her one bedroom apartment, she provides services such as branding, public relations, & marketing for small businesses at an affordable cost. Clients range from small start up companies with just an idea to mid-size businesses looking to gain more customers. All Things Ticketing aims to bring together people and organizations from all parts of the United States (and later, worldwide) and all walks of life to be able to organize events with ease and simplicity. Young or old, large company or small, get your event organized and tickets fulfilled by All Things Ticketing.